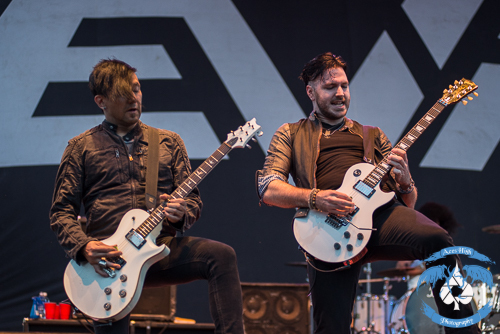 KNAC.COM - Reviews - POP EVIL Live In Canton, Ohio With Photos! 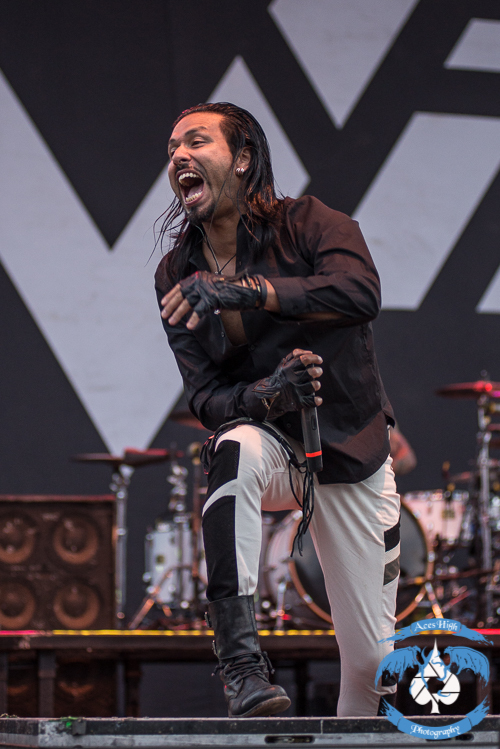 POP EVIL Live in Canton, Ohio With Photos! Around this time every year the city of Canton is flooded with tourists, NFL stars, music and ribs. The local radio stations always bring in a mixed bag of rock, pop, and country artists to perform at the festival grounds in Stark county. I have seen numerous bands perform there; BLUE OYSTER CULT, COLLECTIVE SOUL and TOM KEIFER to name a few. This year was a little different as POP EVIL rolled into town. POP EVIL was an excellent choice in my opinion. Someone had the guts to call up a band with a harder edge rather than using the same old “safe – easy listening” bands of the past. It was a family affair. I saw fans of all ages pile into the grandstands as we got closer to set time. I also took part in that thinking. My three-year-old son has been requesting I play “POP EAGLE” (that’s how he refers to them) every single time we get in the car for over a year now. What can I say? I must be doing something right! So my wife and I decided that this was the right opportunity to introduce him to live music (with the necessary ear protection, of course). As the sun set behind us, POP EVIL took the stage with “Flawed”, off of their latest release, Onyx. Onyx has produced three number one hits since its release on May 14, 2013 and has propelled the band into rock stardom. I appreciated the fact that POP EVIL elected to spread out their acoustic tunes amongst the rockers instead of lumping them altogether into a 3-4 song acoustic set. It makes the whole set flow a little easier and appeases the dynamic audience at the same time. After having the past month off, the group looked refreshed and rejuvenated. Drummer Chachi Riot lived up to his name as he pounded away on the skins. He would often stand up during certain points and tossed sticks back and forth between roadies and guitarist Nick Fuelling. Vocalist Leigh Kakaty seemed to get better and better as the night went on. During the song “Goodbye My Friend” he grabbed a security guard and asked him to take a guitar pick over to my wife who was in the front row. He then said through the microphone; “that is for your son.” It was one of those moments that I will always remember. It only occurred because while I was in the middle of interviewing bassist Matt DiRito (check out the interview HERE), my wife and son were hanging out near the buses where they ran into Leigh Kakaty before the show. During the show Leigh took the time to thank the parents for bringing out their youngsters. He mentioned how passing on the torch was vital to the survival of rock n’ roll. The set continued on before concluding with their three number one singles. They first played the crowd favorite “Torn To Pieces” and then encored with “Deal With The Devil” and “Trenches”. After seeing them three times in the last year POP EVIL are quickly becoming one of my favorite live acts. Whether bassist Matt DiRito is up on the monitors spinning his hair, or guitarist Dave Grahs is flipping his guitar behind his back, the band is very engaging, animated, and entertaining. What more could you ask for? Musically they are always top notch and this night wasn’t any different. My only complaints were that the vocals were a little buried in the mix and Chachi’s snare was muddy sounding – both things that could have been completely out of the band’s hands. 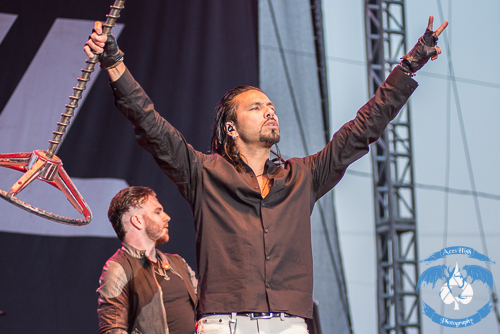 Be sure to catch POP EVIL later this month as they hit the road with the Uproar Festival.